Premises liability is a term for personal injury cases which arise when injury is caused when a person slips or trip and falls as a result of a dangerous or hazardous condition on someone else's property. Dangerous conditions such as potholes, worn carpeting, changes in flooring, height differentials in slabs of concrete, poor lighting conditions or a wet/slippery floor can cause you to slip, trip and fall and injure yourself. Very few people realize that to win a premise liability case, you have to show that the negligent party had “notice” of the defective condition before, not after the accident. 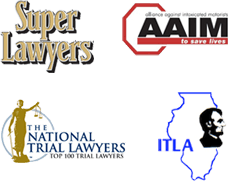 An experienced Chicago personal injury lawyer is vital to proving all of the elements necessary to be successful on these types of cases. Landowners have different degrees of responsibility to different classifications of people that come on to their property. Landowners must protect those who are lawfully on their property from injury. These landowners include business owners and homeowners. For example, business owner is expected to make sure the stairwells in his or her commercial property are clean and safe. It is reasonable to expect that regular checks, maintenance and cleanup will be conducted. However, it is unreasonable to expect that a person will keep watch all day long to make sure nothing is spilled or broken. Make sure to inspect the area where you fell. It is vital that you are able to testify about what caused you to fall. Failure to know what caused you to fall, either through your testimony or from a witness, can lead to the dismissal of your slip and fall case. It is important to document and write down the names, addresses and phone numbers of anyone who witnessed or was close to the area in the where your slip and fall accident occurred. your own testimony along with eyewitness testimony is vital to winning a slip and fall case. Even witnesses who arrive at the scene after you fell can be important to proving your case. They can provide information about the defective condition of the property, how long the condition was there and also discuss how seriously injured you were at the scene of the accident. If the accident occurred in a store or place of business, make sure that your tell the the manager who is working at the time. Asking the manager to do an incident report can document your claimed injury and its cause. Be sure to obtain a copy of the incident report. Photographs or video of the accident scene are vital to the success of an injury claim based upon a slip and fall. Have someone take photographs of the area as soon as possible, so a record is made. The sooner the better, preferably the same day. The dangerous condition can change and its importance will diminish if the photograph does not show the defective condition as it existed at the time of the accident. The old saying, “a picture speaks a thousand words”, is very applicable to winning slip and fall cases. If you fall as a result of some substance on the floor, like grease on a restaurant floor, obtain a sample of the substance if possible. Save your pants and shoes or other items that may have come into contact with the substance that caused your fall. Go seek appropriate medical care immediately upon being injured. Do not delay, as the insurance carrier reviewing the case will consider delay a negative factor in evaluating your claim. If the case goes to trial, a jury may too. After receiving initial medical treatment, contact an experience Chicago injury lawyer who handles claims involving personal injury due to premises liability accidents. Hiring an experienced premises liability lawyer early on can lead to important evidence to prove your case being preserved.